Bye and bye, a BIG envelope was left by Canada Post at our front door. 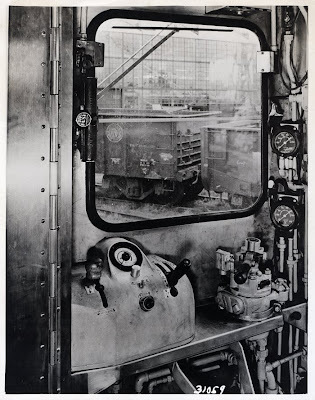 It was from the Budd Company, and very generous in offering a couple of 8x10’s, a large format comb-bound product catalog of self propelled cars – the RDC series, and a number of brochures on other products they were manufacturing. Edward G. Budd Manufacturing had it’s modest start back in 1912, building truck and car bodies. 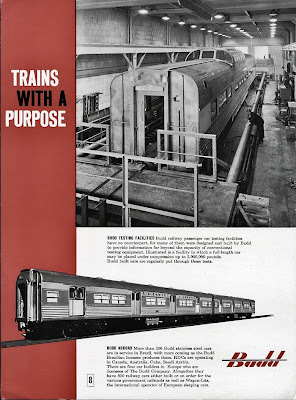 By the mid ’30’s Budd entered the self propelled rail business, pioneering with it’s hallmark material, stainless steel. To be honest with you, the cab of an RDC is pretty basic. My late wife and I rode the cab of Canadian Pacific’s Via Service on Vancouver Island years ago, all the way from the Malahat summit down to Victoria Station. But that’s another story another time. There is a directional control lever, throttle, amp meter, speedometer, radio, and brake stand. Budd was no slouch when it came to being innovative and competitive. In the mid-50’s, Budd built the famous “Roger Williams,” for the highly competitive Boston New York City run. Consisting of six cars; two single end RDC1’s and four twin engine RDC-9’s. This train was further innovative in that it carried third rail pickup shoes, for operating in Grand Central Tunnel. 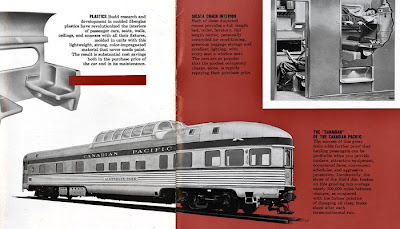 The “Roger Williams” (middle picture) was in built in direct competition with ACF’s (American Car & Foundry) “Talgo” and Pullman-Standard’s “Train-X.” Top picture is Budd's Pioneer III. 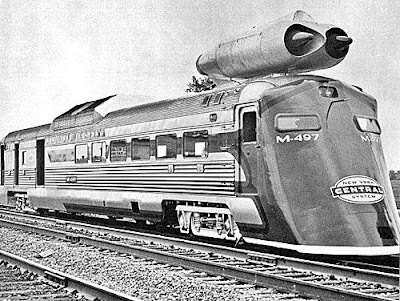 modified RDC-3 hit 183.7 miles per hour outside Melbern, Ohio in July 1966, powered by an engine nacelle off a bomber, with two General Electric J-47 jet engines. Another inovation was the Pioneer III multiple unit electic cars. Only eight were built for the Pennsylvania Rail Road for the New York City - Washington DC corridor, and New York City Chicago run. 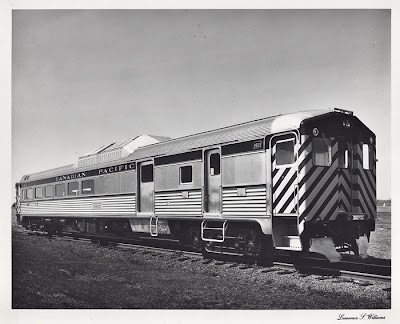 I enjoyed this post, I've always been fascinated with the Budd Co. and in 1980 got to see one of their Finest Products, the former CPR Canadian Rolling Stock when Mum, Dad and I made a trip across Canada by train from Nova Scotia to Vancouver. PS, how do you post your pictures on your blog so they don't expand into a bigger picture. Good to hear from you! When you gonna share another photo or two? In the paragraph about "Innovative and Competitive" the picture shows 3 Budd products: Top- PRR "Keystone" low-slung trainset (not the "Pioneer III" as stated below the picture). 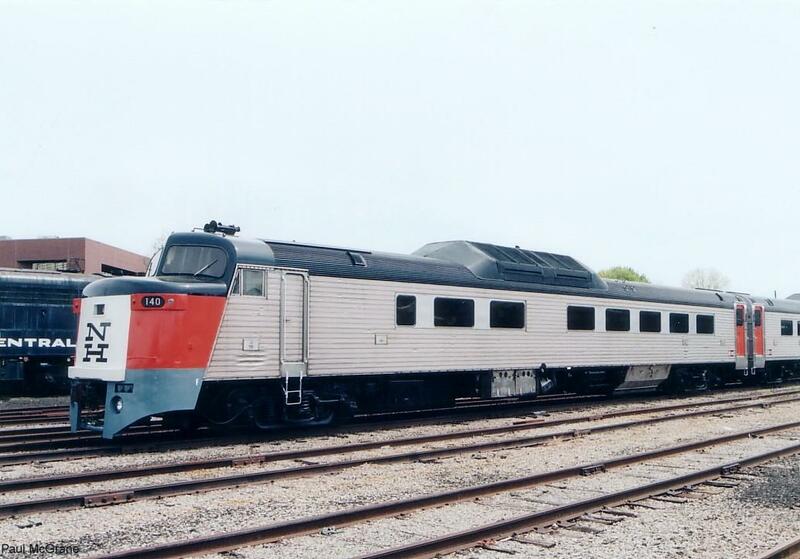 Middle- The "Roger Williams" modified RDC set. Bottom - The Santa Fe "Hi-Level" equipment used on the "El-Capitan". 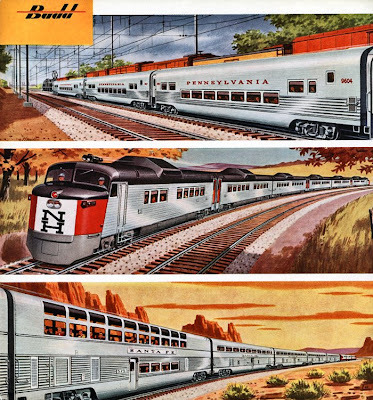 The 'El-Cap' equipment went on to become the design basis for the Amtrak Superliner fleet. 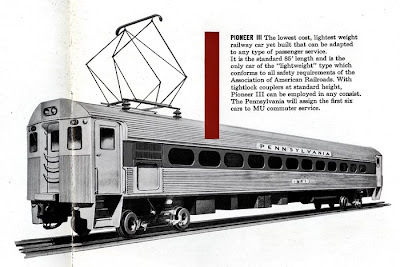 The "Pioneer III": I think only 6 were built, and they served Philadelphia and Harrisburg. 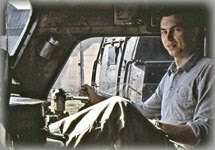 They may have also served NYC, later follow on models certainly did, but they did not go to Chigago: the wire ends at Harrisburg, PA. Great article!